Few of my generation would have been able to hear of the death of Val Doonican without feeling a type of Saturday night we've long since lost. There's a lot of warmth for Val around the web at the moment, so I'd just like to take a moment to salute perhaps his greatest achievement - he was the man who kicked Sergeant Pepper off the number one slot. 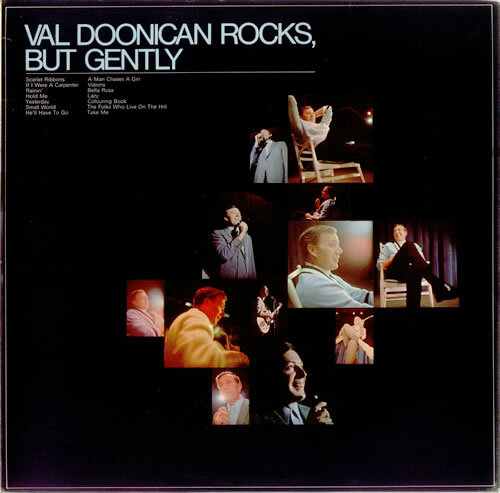 And he did it with the superbly named Val Doonican Rocks - But Gently. It's not quite the hot concept it sounds - in this collection of rock covers, Val found space for The Folks That Live On The Hill, a song which has never, ever been played by any act at Reading. But it's still a lovely curiosity. It says something about Britain of that time - just as Vesta made a mass market out of taking spicy dishes, watering them down, and selling them on, Val did the same thing with rock music. Val Doonican was 88. He died peacefully in Buckinghamshire, as many people in Buckinghamshire do.